The Salon Rue de Cerise, on the third floor of the historic Good Arts Building, is a lovely boutique overnight accommodation, and a unique insider experience for traveling art-lovers, but it is more than that: Your stay supports the Good Arts mission of keeping the building affordable to artistic endeavors. 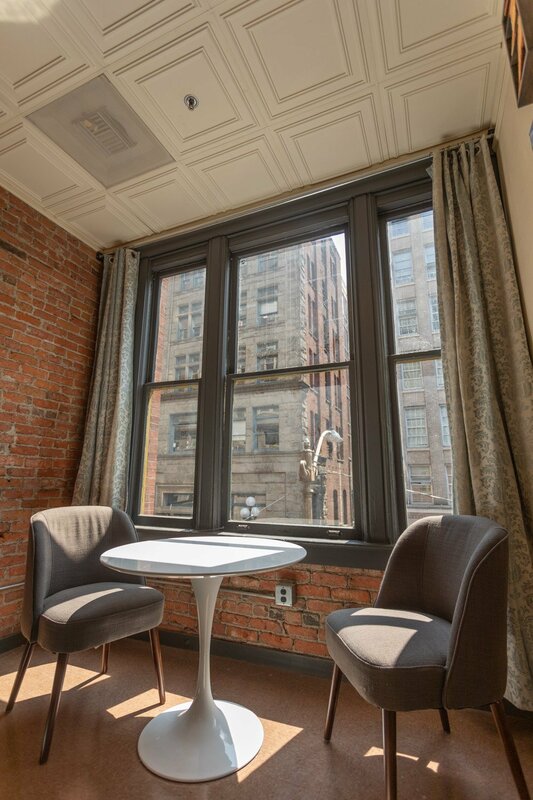 Immerse yourself in this art-filled private nook, nestled inside a building rich with history and filled with working artists, in the heart of Pioneer Square, Seattle’s first neighborhood. 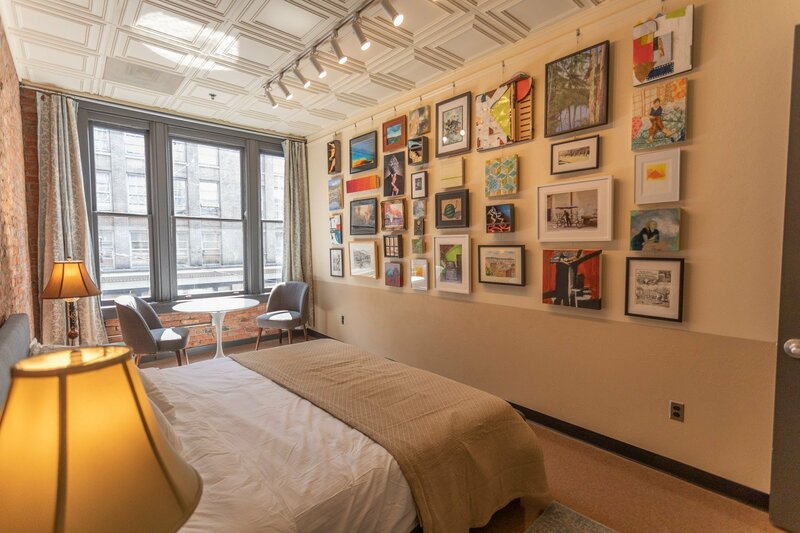 This former caretakers’ apartment put in time as a corporate conference room before being lovingly repurposed again by the resident artists. The concept and decor were inspired by Gertrude Stein’s apartment on the Rue de Fleurus, its walls hung salon-style with art by undiscovered artists whom she collected, supported, and gathered for conversation. Thoughtful details strike a balance between visible layers of history and clean, modern convenient touches. The room even comes with its own private art show. All the artwork on the wall, and some of the furnishings, can be purchased by guests and shipped free within the U.S. 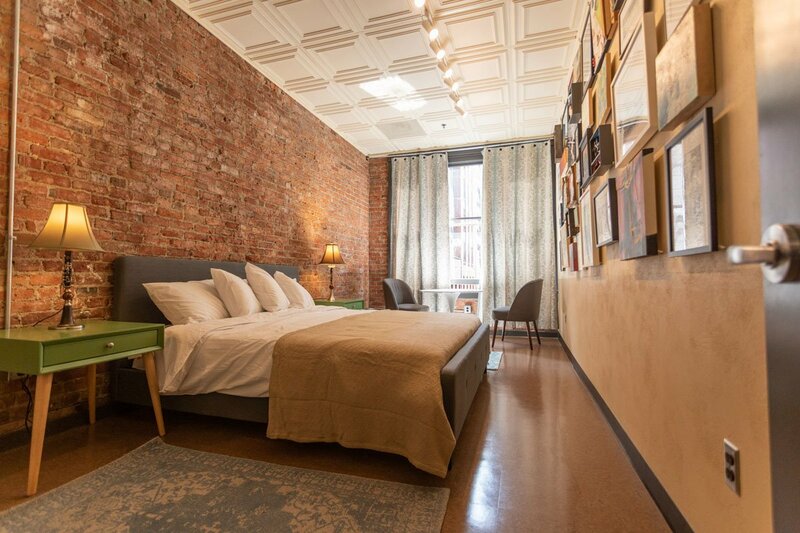 The bedroom is furnished with a king-sized bed, funky modern end tables, bespoke lamps handmade by a local artist, and a cute tulip table flanked by comfy chairs, perfect for watching the comings and goings of this vibrant neighborhood over coffee or a glass of wine. 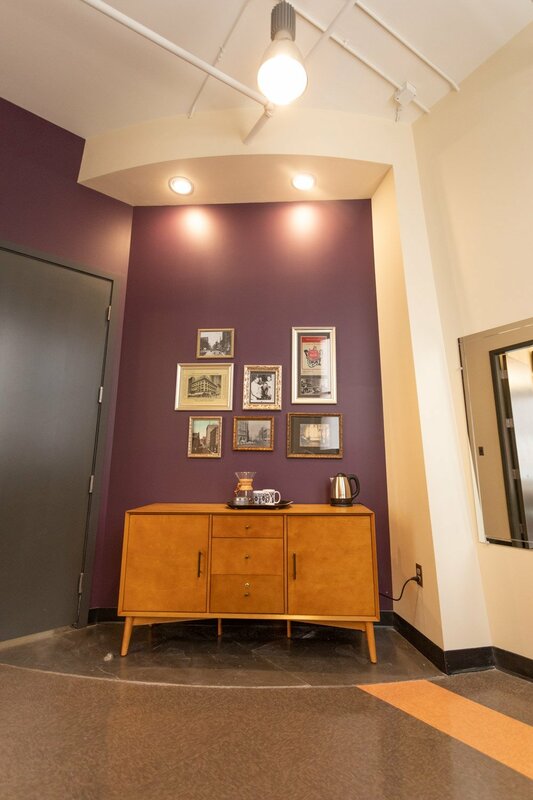 On a credenza in the anteroom, you’ll find a chemex coffee service, an electric kettle, cups, glasses, a corkscrew, tea, and other handy things to make you feel at home. 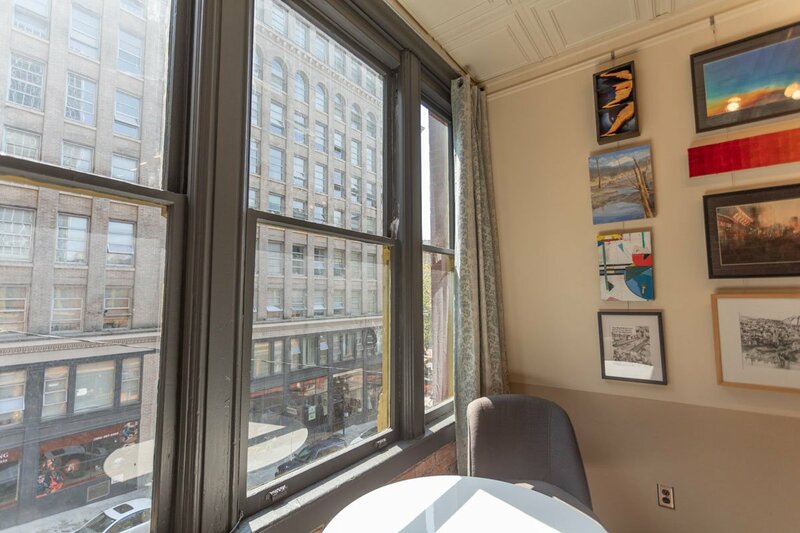 Above the credenza are framed vintage photographs that tell of the rich history of the building and neighborhood. In the private, newly-refurbished bathroom are ample fresh linens, a hairdryer, soaps and shampoos. In the closet are stashed an iron, ironing board, luggage rack, and clothes hangers. Cherry Street Coffee Shop is right downstairs, where you can hang with the locals over a latte and pastry. Our neighborhood, Pioneer Square, has abundant restaurant offerings and charming cocktail bars on every block. A vintage shop, a bespoke tailor, and an artist-run underground tour are within the building, while art galleries, clothing shops, bookstores, and a groovy alternative dinner theatre are among the offerings within walking distance. It’s also an easy walk to the light rail to the airport or Capitol Hill; ferries to nearby islands; and a streetcar to Chinatown. In its 130-year history, the Good Arts Building has housed a jazz club, a speakeasy (which may or may not have been a brothel), a boxing gym, a haberdashery, a two-story diner called “Good Eats”, furnished rooms, a theatre, numerous bars, and Seattle’s first gay and lesbian community center. In 2015, it was purchased by an unlikely partnership consisting of a real estate developer, artists, and an immigrant coffee shop owner who wished to preserve and continue its lively, artsy history. The neighborhood has experienced a recent revival and influx of posh new bars and restaurants, and with them, rising rents. Your hosts at the Salon Rue de Cerise believe that artists ought to stick around to share in the wealth they helped create, as they write the next chapter of the building’s history. You, or your next visitors, can be a part of our story. Book it on AirBnb or VRBO. Artists and arts organizations: Contact us about specials for patrons, visiting artists, and partnering opportunities.